A volunteer firefighter is recuperating in a hospital after fighting off the raging wildfires last week. 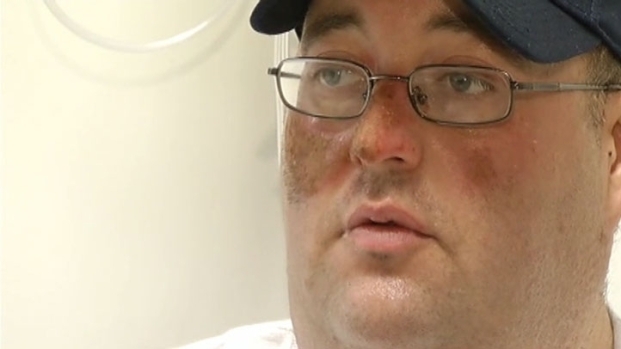 Matt Clark sustained severe burns when his fire truck became engulfed in flames. "I knew my face hurt, and I had already looked at my hands and knew my hands were burned," he said. The fires spread so quickly, it was hard for him and his crew to escape, Clark said. He said he grabbed a fellow firefighter who was lying on the ground before both ran to safety. Clark sustained second- and third-degree burns to his hands and first-degree burns to his face. His wife, Christina, said the scars will heal in time but she would not have been able to replace her loving husband. Clark, who works full-time as a prison guard, has volunteered for the Gorman Fire Department for six months. He has surgery scheduled on Friday at Parkland Hospital. He will then undergo testing and physical therapy to regain use of his hands and fingers.